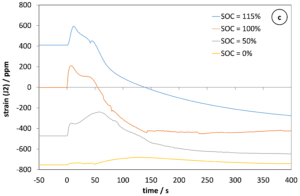 improving the safety of Li-ion batteries in electric vehicles. Improve the in-depth understanding of internal short circuits and thermal runaway mechanisms and their consequences in a battery module. This will be done using post-mortem analysis of battery cells and experimental validation of electrical & thermal modelling and diagnostics at cell & module scales. Based on this deeper understanding, algorithms can be optimized to define safer operating ranges (I,V,T). Detect precursors to thermal runaway using novel proactive methods to enable implementation of measures starting days in advance that can prevent thermal runaway, halt its propagation or mitigate its effect thanks to the development of multi-sensing strategies and algorithms. Overuse, abusive and default conditions that can generate safety risks in automotive batteries pack are numerous. Improve the safety for those batteries requires a large variety of test to be performed. Based on every WP4 contributors skills, know-how and test capacities, a large set of complementary tests has been coordinated, technically defined and initiated. The capacity to detect the thermal runaway precursor is a key point to improve safety by enabling the implementation of preventing measures. Based on complementary analysis and on the set of safety test already mentioned, the capacity to detect those precursors has been evaluated and demonstrated on the EVERLASTING cell at early stage (early warning diagnostic algorithm using efficient parameters generated from the battery voltage and current measurements) and at middle and late stage (using acoustic and strain sensors). A software “Demonstrator” based on a modified electrochemical model has been developed for WP4. 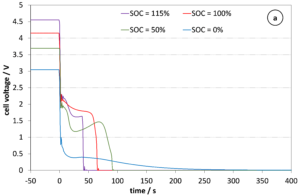 This tool should give the opportunity (once all the physical parameters evaluation of the EVERLASTING cell (WP1) will be finalized) to improve the in-depth understanding of the mechanisms involved in an Internal Short Circuit in Lithium-Ion cells at the local scale. Evolution of the cell voltage, cell casing temperature and cell casing strain in direction of the cell circumference during external short-circuit discharge via 40mOhm rated resistor. The high discharge current results is rapid increase of the temperature and rapid swelling of the cell diameter. The latter indicates a rapid build-up of gas over-pressure inside the battery which activates the CID protection which shuts down the discharge process. In this way the further increase of the temperature and the thermal runaway are prevented. Illustration of the Internal Short Circuit modelling at cell level capability. 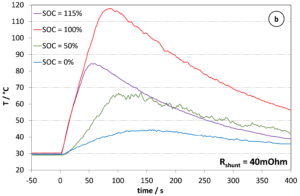 Quantitative evaluation of the EVERLASTING cell internal constraints generated (left : Current density due to the ISC ; right : Thermal gradient generated by the thermal runaway). All the characterization and overuse/abuse and default tests are ongoing and will be finished as initially planned. Activities dedicated to the detection of cells abnormal conditions and the development of detection algorithms will be synthetized in a single computing tool. 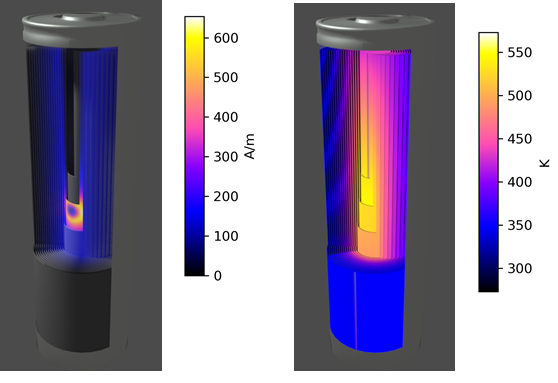 Some modelling Demonstrator with the ability to emulate abnormal condition at cell or battery pack scale will also be delivered before the end of the project. 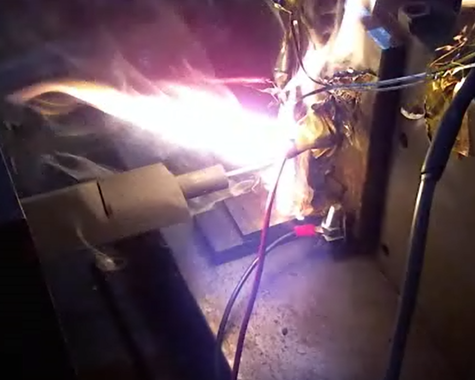 Cell under test at TUV Sud that underwent thermal runaway as a result of nail penetration; the development of the fire from early stages of penetration to the event was monitored with ALGOLiON’s prognostic algorithms which detected and alerted about an impending fire hazard significantly prior to the actual event.